Today our devotion is written by Desiree Taylor. Desiree writes honestly and openly about a struggle many of us face…surrendering to the Lord. In this surrender, we find strength opposite of what the world would have us believe. We pray you will release things as you read today and find strength in the presence of our almighty God. I remember one day when my boys were younger. I was driving to the school where I worked as a Special Needs Paraprofessional. I was rushing and stressed. I broke down in the car and cried out to God in my weariness. Being the faithful, loving Father He is, He proceeded to shine His light into my heart. He began to reveal to me that my weariness was brought on by me. 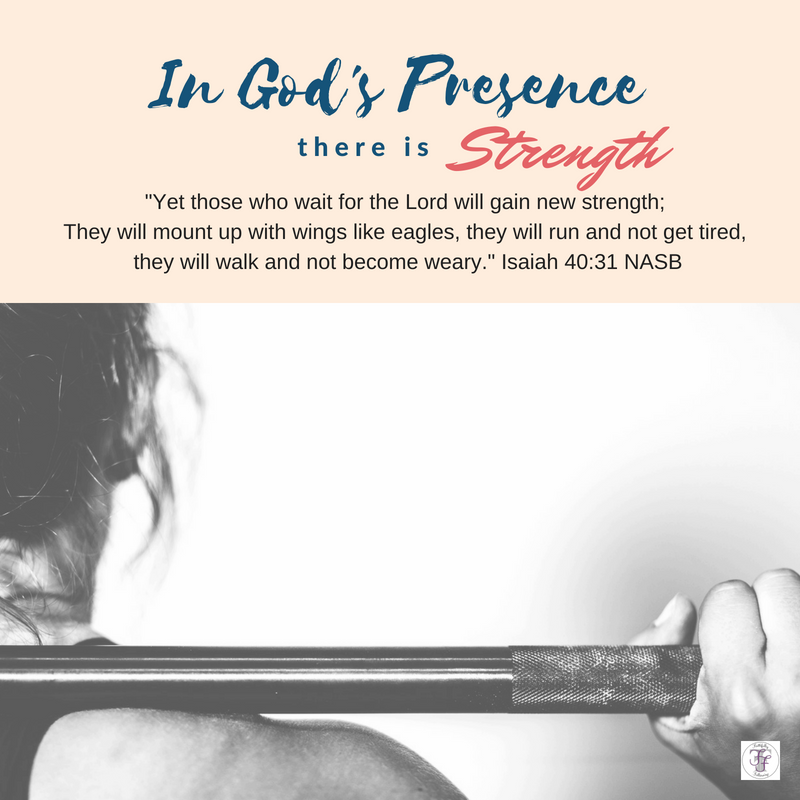 Instead of taking time in His presence to wait on Him for His wisdom, discernment, and timing, I was doing what I decided was best and I was working in my own strength. I have learned over the years that my own strength runs out. I get weary and burnt out when I live this life on my own, but when I sit in God’s presence and give Him time to work and speak, I find strength. When I try to fix my brokenness on my own, I create more. When I give my brokenness to the Lord and surrender to Him, I find healing and strength. When I try to change who I am because I don’t think I am enough, I become someone I am not. When I sit in God’s presence and receive His love and identity, I bloom and grow. When my mother heart breaks and I try to fix it all, I break relationships. When I surrender my children to the Lord, wait upon Him and follow His lead, I am strengthened and able to love them well, where they are. When I see my husband struggle and I work at trying to make things better for him, I fail but when I sit before the Lord and lift him up to God, miracles happen and I am encouraged and strengthened. How I want to live this way more! The more I bring things to God, the more I find peace, hope, and strength. 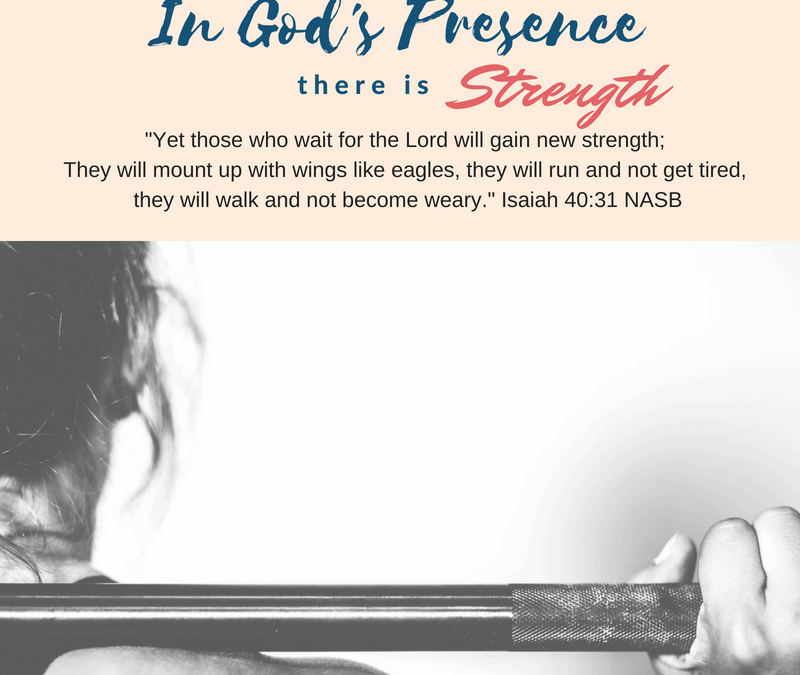 Let’s learn to sit in God’s presence and receive His strength to live this life He has given us. Today’s Prayer: Lord, we come to You today and we surrender ourselves, all the people we love, and every situation we are in right now. Forgive us when we attempt to live in our own strength and wisdom. Bring us to our knees when we allow ourselves to go there. Strengthen us and fill us with Your wisdom today. In Jesus Name, Amen! There is no wonder why we strive so hard to handle every situation that comes our way. Today let’s consider what happens in our weakness when we surrender to Christ. What is made perfect in weakness? How does this knowledge help us surrender to Christ? Is there an area today or a person today that you need to surrender to Christ? Write a prayer of surrender in your notebook. If you are struggling with knowing how to pray or what to pray, read Romans 8:26 and be encouraged! Ask the Spirit to intercede for you. Still feeling weak? Join us tomorrow as we discover that there is community awaiting to lift us up! Here’s my truth…..I’ve been trying “to change who I am because I don’t think I’m enough” for most of my life. I needed these words about God’s truth. Thank you. Oh goodness, Cindy. The thoughts of “not enough”is a lie from Satan. We covered that in our last study, Truth Over Lies. In Christ, we are, but we understand the struggle. I’m so thankful for you and your honesty. It helps to know we are not alone and that we have sisters to lean on.